In my early pen collecting days, I purchased several vintage pens. Unfortunately, I had no idea what I was doing, and I wound up with some real stinkers--a jimmied together Waterman lever-filler that never worked correctly, a few vintage Pelikans, a vintage Parker or two. I had such bad luck with these pens--bladders failing, horrible nibs, pistons sticking--that I eventually swore off vintage pens altogether. Recently, however, I began purchasing a few vintage and pre-2000 pens. I found a vintage Waterman with a steel music nib for a great price on FPN. I bought a Parker 51 on eBay that so far is working well. I purchased an incredible 1970s Montblanc that I’ll be reviewing soon. And I lucked out on a Waterman Edson Sapphire. I actually found a new-in-box Waterman Edson Sapphire for sale, and I was about to purchase it, when one of my awesome pen friends told me he had a user-grade Edson that I could buy much more cheaply. Since I always want pens I can use (I don’t collect pens to keep them under glass), I was happy to get the user-grade Edson. When it arrived and I opened the box, I gasped. It is stunning. The cap is gold plated with a soft, buffed finish. It has a unique clip that wraps around the top of the cap--it sort of reminds me of the nose of an airplane. The clip itself has an interesting cut out design. It’s hard to describe in words, so see the photos below. I think it’s one of the coolest cap designs I’ve ever encountered. The cap is engraved at the bottom with “Waterman” and “Paris.” It snugly snaps on, held by three gold posts that are also a brilliant part of the design. As I examined it more closely, I discovered that the cap was once engraved with someone’s name, but it has been sanded down and buffed off. I’m intrigued by this hint of a previous owner. I can’t read the name, but I love the ghost of it remaining on the cap. 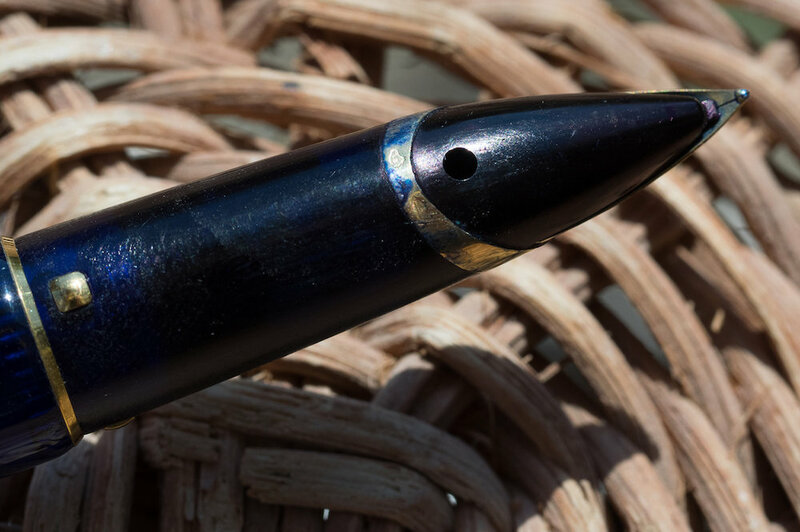 The body of the pen is a deep blue resin that is transparent if you hold it up to light. The grip is a really dark black/blue color and it feels almost rubberized. I’m not sure if this is due to use and age (perhaps ink permeating the material over time), or if this is how all Edsons feel. Regardless, it makes the pen easy to hold because it isn’t slick. The 18k gold inlaid nib is incredible. Just look at the details: the V shape that extends to the grip, the gorgeous “W” logo on the otherwise simple nib, the rounded feed. I could stare at this nib all day. The Edson is a cartridge/converter filler. My pen didn’t come with one of the original converters, which were also sapphire blue. But that really doesn’t matter to me. The converter I have works well and supplies plenty of ink to the nib. The Edson is a large pen. It measures 5.9 inches/150mm capped, 5.2 inches/132mm uncapped, and 6.1 inches/155mm posted. There’s no way I would try to write with it posted. The Edson is a weighty pen at 46 grams with the cap. Without the cap it’s a more reasonable 26 grams. Most of that weight is in the nib end, but the barrel actually has brass threads that also give the pen some weight in the middle. I love writing with this pen. I inked it with Iroshizuku Kon Peki which is a great match. The medium nib is super smooth and juicy, but it has absolutely no bounce or flex. I knew that before I bought the pen, so this was not a disappointment. I find the large grip and the weight of the pen to suit me perfectly. Writing with it is a pleasure. I am absurdly in love with this Waterman Edson. I adore its retro looks, the clean lines, the color, the weight, the ghostly remnants of a previous owner’s name. It’s like owning a retro sports car--it handles well, is really solid, and shines like a jewel. 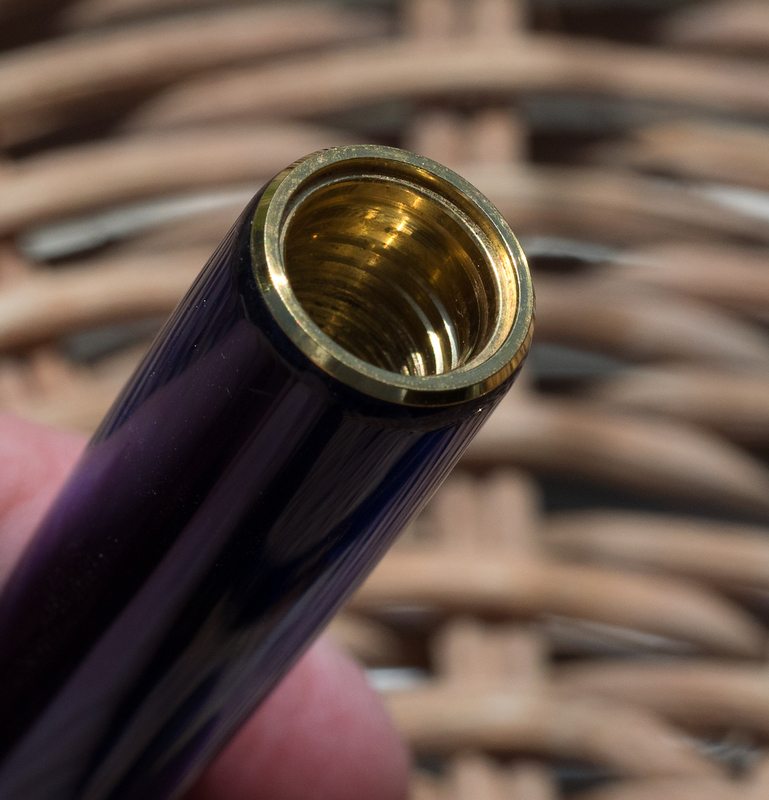 Posted on March 22, 2019 by Susan Pigott and filed under Waterman, Fountain Pens, Pen Reviews.